Umatilla's strong defense helped them control the game. UMATILLA - In a Thursday night December 11 game at the Columbia River Classic Umatilla hosted Helix in boys first round action. Umatilla won 87-35 with speed, ball control and a strong defense. Umatilla held Helix scoreless for the first three and half minutes of the game taking a 14-0 lead. 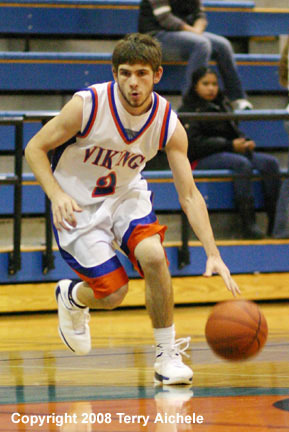 Ruben Navarrete stole twice going the length of the floor for a layup in the opening two minutes of play. Also scoring early for the Vikings were Steve Williams and Peter Stice. Helix got on the board on a freethrow shot by Tylor Bushman. 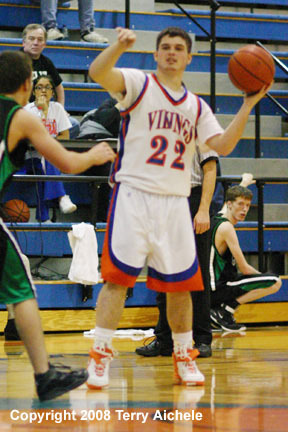 As the quarter progressed Taylor Pankey, Nathan Creason, and Kasey Pankey added to the Vikings total. Umatilla lead at the end of the quarter 31-10. 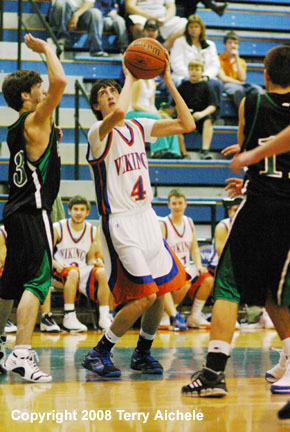 Umatilla continued their dominance in the second quarter scoring 21 points to Helix's five. Navarrete and Williams continued their hot shooting streak with Lee Bursell, Francisco Campos and Levi Russell contributing to the scoring runs. Umatilla held Helix at 10 for nearly six minutes during the period. At halftime Umatilla had the lead 52-15. Umatilla's coach Tony Villanueva rotated more players into the game during the third quarter as Umatilla continued to dominate on offense and defense. 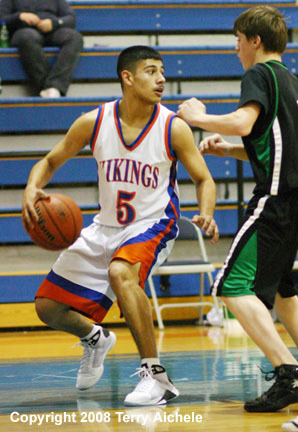 Mark Montez was among the scorers in the third for the Vikings. The end of the third had Umatilla leading 71-27. Umatilla controlled the game during the fourth period much as they had during the rest of the game. The Vikings scored 16 points to Helix's 8. The Vikings showed a smoothness, athleticism and team chemistry was blended well in their opening game of the Columbia Tournament. Umatilla won 87-35. 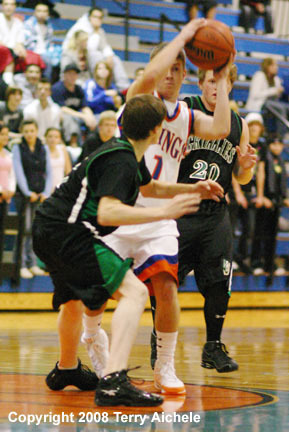 LEFT - Umatilla's Levi Russell with the ball guarded closely by a Helix player. RIGHT - Steve Williams of Umatilla looks for gap to drive through. 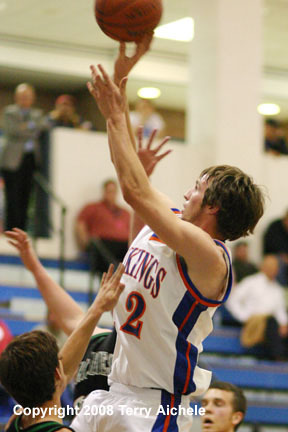 LEFT - Nathan Creason of Umatilla drives to the basket for a layup. 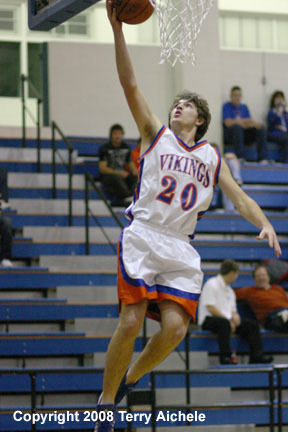 RIGHT - Lee Bursell of Umatilla goes in for a layup. 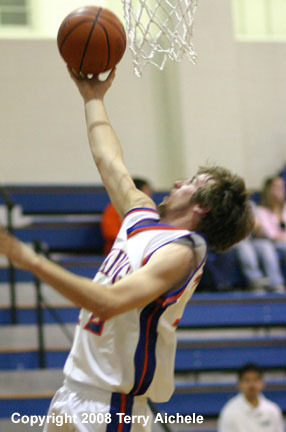 LEFT - Kasey Pankey of Umatilla goes up for a shot. RIGHT - Umatilla's Ruben Navarrete guarded by a Helix defender. 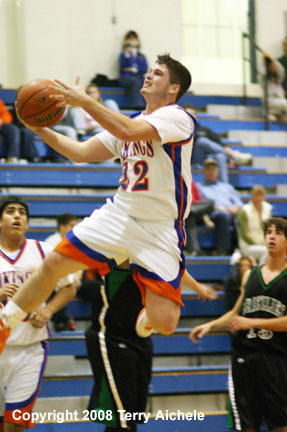 LEFT - Mark Montez of Umatilla eyes the basket. RIGHT - Kasey Pankey of Umatilla shoots a jumper. Nathan Creason of Umatilla motions for a teammate to break away for a pass.